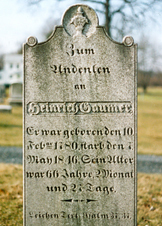 Heinrich "Henry" Gaumer was born on Feb. 10, 1780, the son of Johann Heinrich and Anna Margaretha (Meitzler) Gaumer. He was joined in holy wedlock with Susanna Mory (1793-1878). The date of their marriage is unknown. The Gaumers lived in or near Alburtis, Lehigh County, PA. They were the parents of one known son, Aaron Gaumer. Susanna outlived him by more than three decades. When the 1860-1870 federal census enumerations were made, she lived in the farm home of her son Aaron in Lower Macungie Township, Lehigh County. The Grim Reaper swept her away at the age of 85 on Sept. 30, 1878. Demonstrating that German language and customs were passed down several generations in this branch, Heinrich's grave marker is inscribed in German, using the old gothic script. The well-preserved gravestone is found at the cemetery of the Zion Lutheran Church in Alburtis, PA.